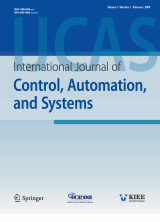 Abstract : "This paper is concerned with the guaranteed cost control for a class of networked control systems (NCSs) with denial-of-service (DoS) attack and time-varying communication delay. First, an uncertain switched system model is proposed that is capable of capturing the DoS attack and the short time-varying delay simultaneously. To achieve the exponential stability with a guaranteed cost performance level, a sufficient condition is derived in terms of matrix inequalities. In our work, the proposed design condition establishes several quantitative relations between system performance and attack parameters. Moreover, the critical value of strong attack frequency is also obtained. Finally, a practical example is given to show the effectiveness of our results." Keyword : "Denial-of-service (DoS) attack, guaranteed cost control, networked control systems (NCSs), switched system, time-varying delay."